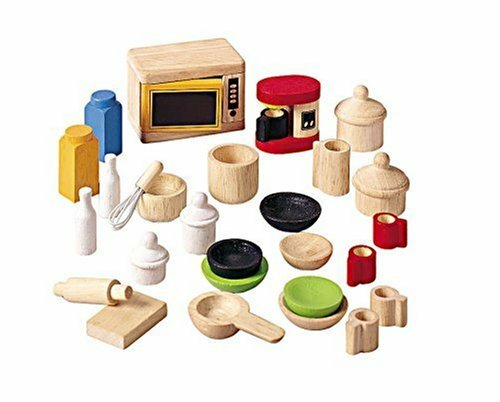 343200 Features: -For ages 3 years and up.-Environmentally safe materials.-Realistic design.-Encourages children to role play different characters.-Stimulates the imagination of children.-Learn how to use different products, reasoning, spend money wisely, and basic calculation.-Material: Rubberwood. Dimensions: -Overall dimensions: 9.06'' H x 7.4'' W x 2.95'' D. Collection: -Large Scale collection. Encourage healthy food choices through pretend play! 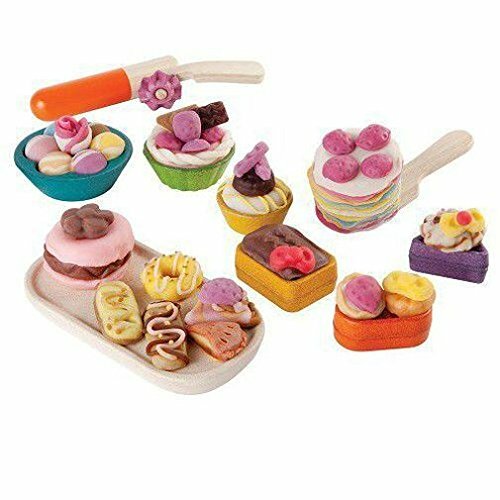 The Playfully Delicious Fresh Fruit Set is a well loved kid selection, and for good reason. 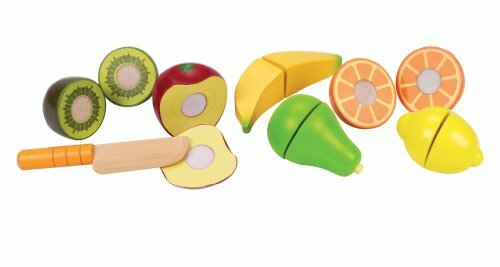 This seven piece set features a kiwi, banana, apple, pear, orange, and lemon, along with a wooden toy knife to "cut" between the sturdy Velcro fasteners that secure the halves of the fruit. 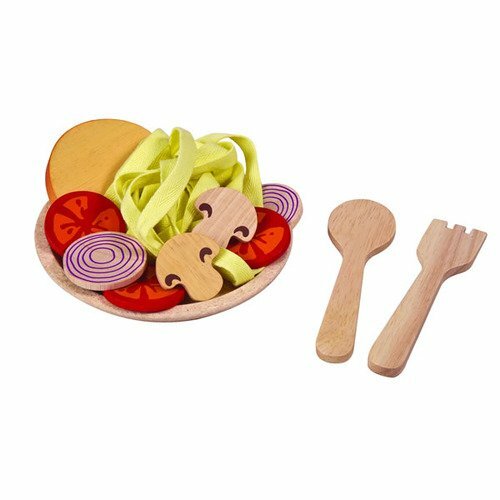 This innovatively designed set encourages healthy food choices while incorporating imaginative role play and storytelling. Enjoy these fruits as a snack or combine with other Hape Playfully Delicious food sets for a mouthwatering meal for the whole family. Made from wood sourced from environmentally sustainably sourced forests. Durable child safe paint finish and solid wood construction make this a toy your child will love for years to come. Hape toys stimulate children through every stage of development and help nurture and develop their natural abilities. All Hape products sold in North America meet or exceed all applicable safety standards. The Fresh Fruit Play Food Set has been proudly named The Bump's Best New Product. This set includes steak, slide, fish, sausage, chicken drumstick, salami, bologna and a knife. Velcro attachments create realistic chopping sounds when the foods are cut. 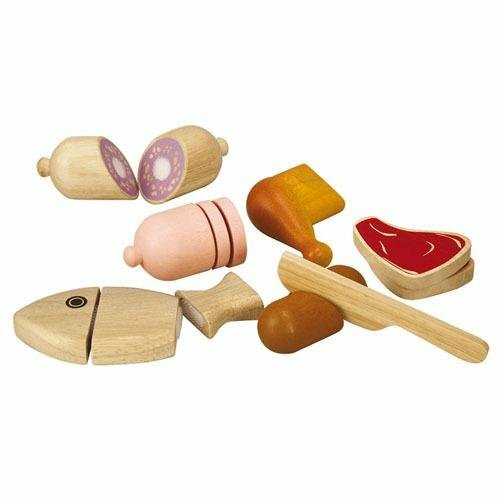 Playtime Ideas:Children love to be little chefs while playing with Meat Set.Children can slice all kinds of meat in multiple pieces that stick together with sturdy velcro, then fit them back together.They can role-play by preparing meals which will help develop their fine motor skills and imagination. 341600 Features: -Set includes: Apple, Pear, Lemon, Orange, Banana, Mushroom, Carrot. -For ages 3 years and up. -Material: Rubberwood. -Environmentally safe materials. Product Type: -Play food. Primary Material: -Wood. Age Group: -9 to 10 Years. Age Group: -3 to 4 Years. Age Group: -13+ Years. Age Group: -7 to 8 Years. Dimensions: Overall Height - Top to Bottom: -11.02 Inches. Overall Width - Side to Side: -9.06 Inches. Overall Depth - Front to Back: -2.48 Inches. Overall Product Weight: -1.59 Pounds. 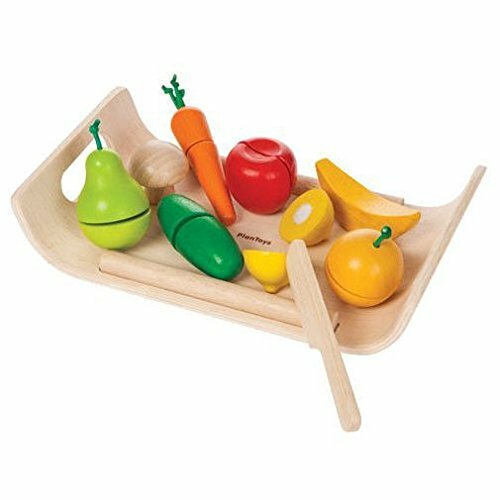 PlanToys sliceable fruits & veggies pretend play food set encourages children to safely learn how to cut food. Connected with easy to slice hook and loop pads allowing them to discover what the inside of food looks like. Set includes: 2 knife, 2 cotton bag, and 3 of each sliceable: fruits; Apple, orange, and strawberry and veggies: Mushroom, turnip, onion. Bring out the inner pastry chef and create your own delicious delicacies! This set includes 6 different pastry molds, a dough cutter, rolling pin, a small tray that also has 3 additional molds and a baking spatula! Recipe included for making playdough from common household ingredients. (Dough not included). 346600 Features: -Great for pretend and imaginative play. Includes: -Set includes spaghetti, 1 plate,1 fork, 1 spoon, 1 slice of garlic bread, 2 slices of mushroom and onion and 3 slices of tomato. What's on today's menu? 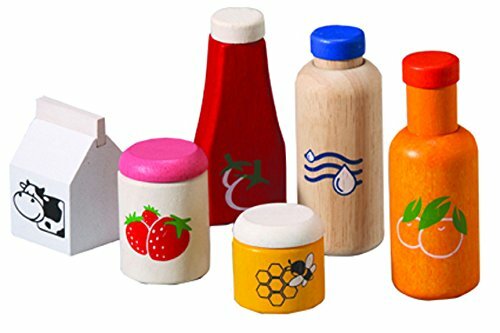 The Playfully Delicious food set from Hape perfectly complements other products within the Creative Cookery collection. 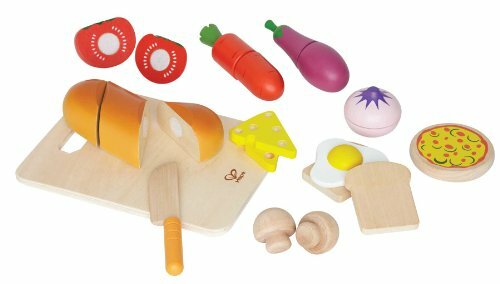 Featuring bread, cheese, vegetables, eggs, a cutting board and child safe knife, this food set is sure to inspire hours of cooking fun with family and friends! 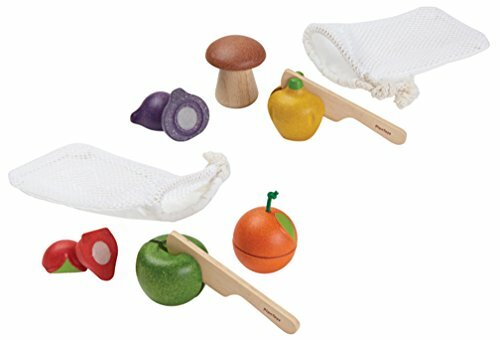 Easy to cut Velcro veggies help introduce kids to food preparation techniques. Encourage your child to imitate and create storylines as they practice role-play and imagining their menu. Durable child safe paint finish and solid wood construction make this a toy your child will love for years to come. Hape toys stimulate children through every stage of development and help nurture and develop their natural abilities. All Hape products sold in North America meet or exceed all applicable safety standards.